This article follows on from my previous article where I look at how Microsoft seems to be in the midst of a massive rebrand despite not having announced that that is what they are doing. This specifically looks at the new logos being used on several recent products and leaks. This article instead looks at a possible new Microsoft company logo and how things appear to be being named. I noticed that in all the official marketing for the new Surface tablet Microsoft’s iconic italic logo is no where to be seen. Instead there is simply “Microsoft” in the Segoe font (semibold variant I think) that is synonymous with the Metro UI and I think that this is Microsoft’s new logo. Paul Thurrott also seems to think that this is going to replace the classic logo. I like the fact that Microsoft is using the Segoe font for everything but I think that without an icon to sit next to the Microsoft text it looks boring and in fact could easily be missed. However, this idea of people not noticing the Microsoft name as much might actually be part of Microsoft’s bigger marketing plan. If you look at the logos in the previous post you’ll notice something missing from the product names that can be found in the current branding of the same products. The logos are all missing the name “Microsoft”. There is currently one major product that I can think of that currently doesn’t have the Microsoft name in its brand and that’s the Xbox. That’s Microsoft’s run away consumer success story and I think that Microsoft is looking to emulate that brand detachment to remove any negative connotations that company’s name might have from it’s individual brands. This can even be seen when booting into the Windows 8 Release Preview as all that stands out when it boots is “Windows”. There is no version number and no company name. Consumers often don’t really care who makes the product they are using or at the very least don’t need to be told who makes it every time they go to use it. Equally once they have purchased the product they probably don’t need to be informed at what version of the product is. The idea of removing version names and numbers from the product names highlights Microsoft focus on the consumer market where people don’t care nor need to know. It does, however, require that things work seamlessly together. People need to know that they can send an Office document to someone and that they will be able to open it whatever version of the software they might be running. Thankfully I think Microsoft is pretty much there with that kind of compatibility across its products. But going back to Surface I have read through the official Press Release about Surface and one thing struck me, it is not called the “Microsoft Surface”. Not once. In fact there are only two mentions of “Microsoft Surface” on the page, one is a tag for the post and another is a link to the video of the announcement. It looks to me like when Surface launches it will doing so without the name Microsoft being centre stage. 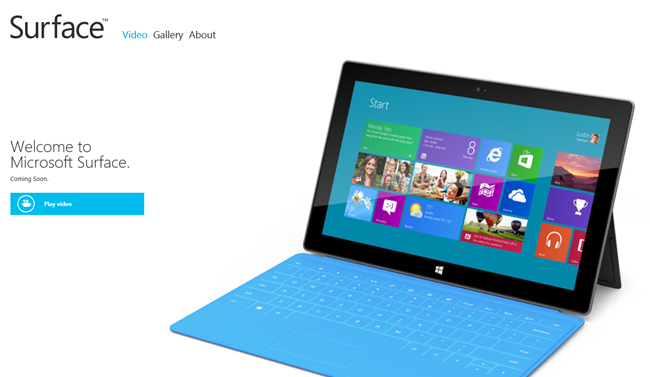 And yet there is some confusion as on the official Surface page the text reads “Welcome to Microsoft Surface” but the page is titled “Surface by Microsoft”. Although, the Surface logo itself doesn’t feature any reference to Microsoft and on the about page it is only referred to as Surface. This apparent rebrand looks to be even more dramatic than I had originally thought. It looks like Microsoft as a brand is trying to detach itself from its individual products whilst allowing the products’ brand to all work well together. This actually matches up with Microsoft’s ethos too in that the technology should disappear (Microsoft) and allow the user to seamlessly work across a range of devices (the new branding) as and when they need to. There were a few other rebranding things noticed in the Surface announcement such as a new logo for the Windows Store and SkyDrive, both of which can be seen in the above image of the Windows 8 Start Screen on Surface. I shall be paying close attention to this afternoon’s Windows Phone Summit to see if there is anything else to back up my thinking of this rebrand. What are your thoughts on this supposed rebrand?